Carer and dedicated local volunteer Warren Gibson, who does a great job recording our concerts, hit a financial rough spot recently. Last year one of his clients tried to attack him. A witness to this saw it as abuse when Warren tried to defend himself . The investigation left him totally bankrupt so Jenny planned this fund raiser to help him get back on his feet. It was great night and well organized by Jenny and Maeve who spent many hours arranging advertising, gift donations from local organizations for raffle prizes and artists who were willing to donate their expertise for a good cause. 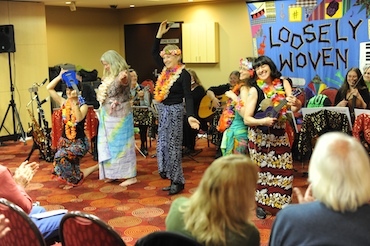 The main act, Loosely Woven, made quite an impression on our audience, getting us all to sing-a-long with songs by Denis Kevans, Bruce Watson and Kevin Murray. They were all delivered with humour and pathos by this very generous and talented group who emphasize the importance of making music for fun!! 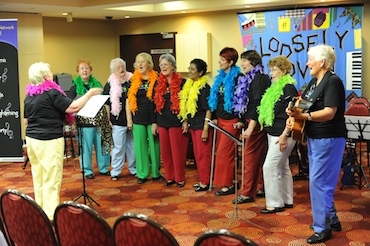 Many traveled long distances from all places around Sydney and beyond to donate their skills for this worthwhile cause. I love the way they presented the story behind the songs especially in 'Four Strong Women' by Maurie Mulheron about the four women from the UK who dared to break into British Aerospace in Lancashire and destroy the jet Hawk which was destined to be used against the villagers of East Timor. 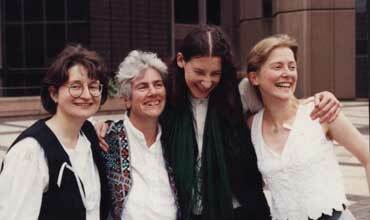 The four women succeeded and were later found not guilty after John Pilger’s documentary was shown at their trial. Thanks to all members of Loosely Woven . Your input was greatly appreciated. Our own local OWN (Older Women’s Network) group got a good laugh from the audience with their no-holds-barred send up songs of pollies and the youngsters who ignore the value of older women. Jenny even delighted us with a ballet dance! 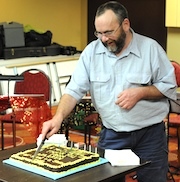 Warren was completely overwhelmed and appreciated all the effort and time spent in making it such a night for him. The amount raised has gone part way towards covering Warren’s losses. Thanks all who came for your support. We all thoroughly enjoyed ourselves. Make sure you get to our next concert on 13th November at Sutherland Acoustic Night- when we will have the pleasure of being entertained by three greats in the folk scene - Broomhall, Spillane and DeSanti.